Interface was created in the early 2000s around its Endexo fluorinated surface modification technology, which enhances the biocompatibility of medical devices that come into contact with blood or other body fluids. As an additive rather than a coating, Endexo is incorporated during the manufacturing process and migrates to the surface of a device. From a clinical perspective, the Endexo additive has been demonstrated to reduce the threat of infection and complications related to thrombus. Endexo’s partnerships include Fresenius Medical Care and Angiodynamics. The company’s second technology platform is Kinesyx, with similar fluorinated oligomers that coat the surface of medical devices with various drugs with a tailored drug release profile, depending on therapeutic requirements. Interface’s third technology, Epidel, is a “non-polymeric sustained drug delivery platform technology with significant advantages over current polymeric approaches. The technology is highly engineerable for the custom design of implants, drug release duration and kinetics,” Ms. Dealhoy explains. Epidel’s lead candidate is a dexamethasone intravitreal implant, IBE-814, for the treatment of posterior inflammatory eye diseases, initially targeting diabetic macular edema (DME), retinal vein occlusion (RVO) and non-infectious uveitis (NIU). The company completed preclinical studies in 2018 and expects to start a Phase 2 program with IBE-814 in 2020. “Our pre-IND meeting with the FDA in October 2018 was a pivotal point for the company, not only validating the technology but also confirming an efficient and cost effective regulatory pathway going forward in ophthalmology,” Ms. Dealhoy points out. “Within two years, we expect to have three programs in clinical development, including advancing the technology into pain and osteoarthritis,” she adds. Ms. Dealhoy explains that the Epidel drug delivery technology has broad applications across a range of therapeutic areas and drug classes. While the company’s initial product is an injectable implant for inflammatory posterior eye disease, “we can formulate the technology into micro-and nano-particles and coatings for medical devices, including wafers for post-cataract inflammation and minimally invasive glaucoma surgical devices,” she adds. The company has focused on ophthalmology not only because of the size of the market but also because of the need for local drug delivery. The total addressable market for IBE-814 in posterior inflammatory diseases includes more than 1.1 million RVO patients in the U.S., 560,000 DME patients and as many as 120,000 NIU posterior patients. In addition, there were 4.4 million cataract surgeries performed in the U.S. in 2017 and 2.7 million patients with open-angle glaucoma. 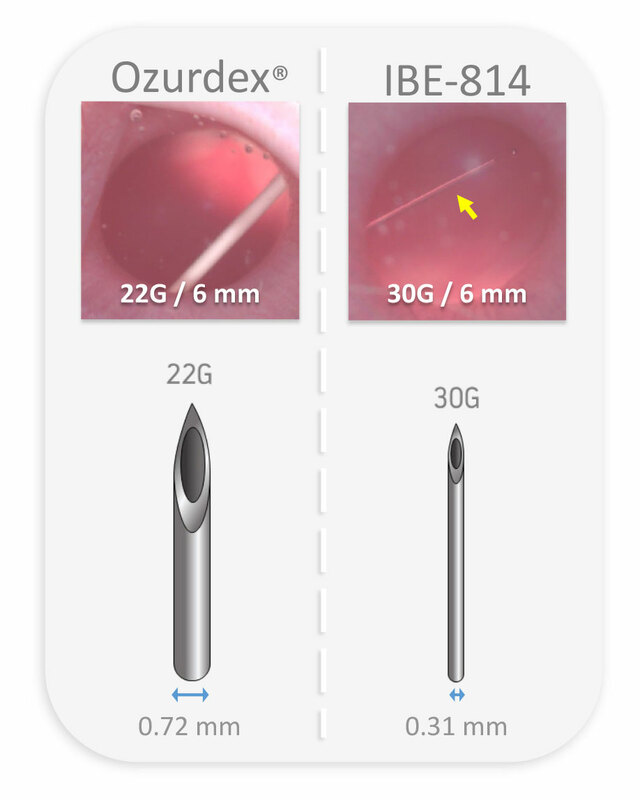 The Ozurdex implant also has an initial burst of drug release that tapers off and lasts for around three months, while IBE-814 is designed to deliver a constant dose for up to nine-to-12 months, and eliminate the side effects of polymer degradation, floaters and inflammation, she adds. In the fourth quarter of 2018, Interface received FDA approval for a 505(b)(2) regulatory pathway for IBE-814, which would require the company to only match the efficacy and safety data of the Ozurdex implant. Interface plans to spend most of 2019 confirming the chemistry, manufacturing and controls as well as the toxicology of IBE-814 in order to begin a Phase 2 proof-of-concept trial in Australia in 2020. The company also plans to initiate discussions with potential pharma partners to assess their interest in IBE-814. “We also intend to initiate discussions with external venture capital firms to assess their interest in funding Interface 2.0 in conjunction with our existing investors and hope to complete a financing round by the end of 2019,” Ms. Dealhoy says. If the Phase 2 study is successful, Interface intents to initially focus on an approval for DME in the U.S., which could be obtained within five years and require only one pivotal Phase 3 trial.